The idiom “Live and let live” expresses the idea that you should be able to live any way you choose, regardless of what others may think. But civility doesn’t exist in the absence of “regard.” Etiquette is about being “regard-ful,” and your consideration of others. This is also known as respect. So when you observe an absence of regard – when others demonstrate disrespectful, inappropriate, or careless behaviors – does this give you privilege to correct their behavior? When you mind your own business, you take care of your own responsibilities and don’t interfere in the responsibilities of other people. However, if you are a parent, manager, or employer, you have supervisory and educational roles to play. A parent must correct his child from misbehaving in a restaurant, but the person sitting at the table next to him should not. In business, there are company policies and procedures to follow. If it happens that you fall out of line with these company rules, it is your supervisor’s responsibility to let you know. She may say, “Of course, tell me.” Then she is ready to learn the correct method of following procedure. Or she may respond with, "I know this isn't according to procedure, but it's the method that is most efficient for me." In this case, the correction falls to Mary's supervisor. It is not your responsibility. It’s important to be clear on the boundaries for correcting behaviors. Your very intelligent boss may have developed certain bad habits with his grammar, and if you have an understanding that he would like to be reminded in private when he’s made an error, then fine. But generally, no. Etiquette errs on the side of no. Would this same relationship allow you to tell him that he has a bad habit of interrupting you? That’s situational. It would depend on where he interrupted you. Or contextual, the circumstances under which the interruption occurred. Pointing out someone’s social mistakes is not good manners. When you are in public and observe someone clearly out of line, should you tell that person then and there? It depends on your relationship and the situation. If you are in a restaurant with a loved one who is talking on his phone, you might quietly signal or ask him to end his call if the conversation is too loud or lengthy. But if it's a stranger sitting at a table next to you talking loudly on his phone, I suggest moving to another table or shifting your focus elsewhere if you can. An attempt to correct this behavior outright could lead to a confrontation. The more public you are and the greater the relational distance is between you and someone else, the less inclined you should be to interfere or suggest a change in behavior. For instance, if you are at a concert and someone is throwing food, you should not interfere, but should seek out a person whose job it is to handle the disruption. 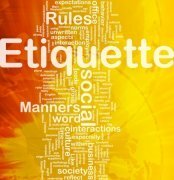 Even though etiquette usually calls for us to avoid correcting behaviors, there are situations that warrant it. Especially when someone is in danger. You're leaving a party and notice someone who is clearly inebriated about to drive himself home. Offer him a ride, or find him one. A person walking along a sidewalk while on her phone doesn't notice she is about to cross a street into oncoming traffic. If you're close enough, call "Look out!" or tap her arm to get her attention. The danger of the situation asks you to change the protocol a bit. We take care of each other when we need to. The majority of times when you feel the need to correct behaviors are great opportunities to practice self-control. It's always better to mind your own manners rather than someone else's.